The Ectasian may or may not have been an eventful period. However, the end of the Ectasian is the earliest date by which we can be fairly certain that certain really important events had taken place. For example, we do not know when the first eukaryotes evolved, but we can be generally sure that it happened by the end of the Ectasian. The data is not the best; but, as we will see, it is getting better. In fact, we can not only be sure that eukaryotes were present, but that the eukaryotes of 1200 million years ago included both green (Chlorobionta) and red (Rhodophyta) algae. Similarly, we don't know exactly what cratons made up the supercontinent of Rodinia, but we know that it began to assemble by the end of the Ectasian. Further, we now know a good many details about the history of North America, in particular, during this interval. Advanced eukaryotes and supercontinents may have been around for a billion years before the beginning of the Ectasian -- or they may not. However, there is little question that both had developed by the end of the Ectasian. As noted, the Ectasian includes the beginning of the assembly of Rodinia. More particularly, the Grenville Orogeny began in the Late Ectasian, some where between 1300 and 1200 My ago, and continued almost through the entire Stenian. 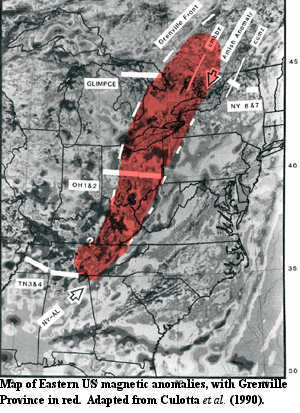 A continuous mountain-building episode lasting over 200 My would be difficult to accept; so it is not surprising that the Grenville is probably not a single event, but a series of many events, as various continents and island arcs subducted under, accreted to, or simply bounced off, the eastern and southern margins of North America. Along the eastern margin of North America, the Grenville orogeny seems to have been complicated and weirdly familiar. It involved at least two episodes in which at least two island arcs attempted, like continent-sized whales, to beach themselves on the North American craton. After considerable confusion and fragmentation, subduction polarity reversed, after which the same arcs were subducted under the continent. This, in turn, was followed by collision with another continent-sized body, probably Baltica. The net result was a temporary merger between North America and Baltica, with the former island arcs crushed between them. After Rodinia broke up, those same terranes formed the Grenville Province -- a strip about 200 km wide added to North America from the Quebec-Ontario border to Tennessee. Culotta et al. (1990). The "weirdly familiar" part is that this entire series of events was replayed, in almost every detail, 800 My later during the Acadian Orogeny of Late Ordovician to Mississippian time. This added another 200 km to North America, just east of the Grenville Province. That seems stretch coincidence a bit far. However, we are not aware of anything which would explain the similarity. On the current state of the evidence, Eukarya had probably evolved well before the Ectasian. It has become common to cite the 2770 My (Neoarchean) date suggested by Brocks et al. (2003) as the minimum age of Eukarya. While we have serious doubts about this date, it may be sufficient for the present purposes to note that those authors were attempting to estimate the age of the stem group, badgers > bacteria. That stem is a long one. The same authors show the eukaryotic crown group as younger than 1640 My -- Mesoproterozoic or younger. The first solid evidence for crown group Eukarya men + Metamonada) is probably the Stenian rhodophyte Bangiomorpha, discussed in the section on Proterozoic acritarchs. Javaux (2006). We aren't going to repeat the basic discussion on acritarchs, and almost all of the probable eukaryotic fossils older than the Neoproterozoic are acritarchs. Thus, so you might want to go back to that one. A really conservative definition of the crown group (e.g., people + plants) might even require rigorous evidence for opisthokonts (people > plants). Oddly, no one has identified convincing evidence for opisthokonts at any point in the Mesoproterozoic. 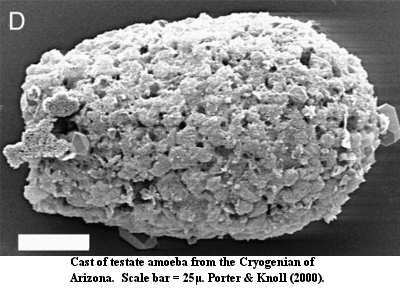 So far as we know, the oldest relevant fossils are Cryogenian (742 My) testate amoebae identified by Porter & Knoll 2000). So, what organisms left the fossils recovered from the Ectasian? The usual answer is "green algae." However, that's a phylogenetic dodge. The term can mean almost anything from glaucophytes to charophytes. Teyssèdre 2006) makes a very good case for something much closer to land plants than to glaucophytes. His lengthy discussion begins with a pointless attack on a figure from an old paper by Knoll which, as Javaux 2007) has pointed out, probably misapprehends the figure -- and the figure certainly does not represent Knoll's present position. In addition, portions of Teyssèdre's phylogenetic framework are not well supported. All this, and the fact that it was published in French, have ensured that the real substance of his review will be ignored. This is too bad, since it deserves more serious attention. In essence, Teyssèdre argues that biologists, paleontologists, and biochemists have failed to keep up with each others' progress in this area. Reinterpretation of older work (by, for example, Yin and Shopf) in light of the current understanding of algal diversity and development, allows us to identify these simple Paleoproterozoic acritarchs as as relatively derived charophytes. In particular, Teyssèdre emphasizes the partitioning of the surface, an equatorial zone of weakness, the trilaminar structure of the capsule, and its pronounced aromatic composition. On the last point, we suspect he is mistaken. The organic walls of algae, no matter how resistant, are degraded to kerogen after 1000 My or so, and variations in aromatic content are probably due to variable thermal maturation of kerogens, not to the original composition of the capsule wall. See, e.g., Wei et al. (2005). This morphological evidence is still strong enough to make a reasonable case for charophytes in this general time frame -- reasonable, although not air-tight. But, speaking of air, the case for these proto-plants is somewhat tightened by models of Proterozoic oxygen which show a sharp rise just before the Ectasian, followed by a steady increase in organic carbon burial during the Ectasian Period. See, e.g. Canfield 2005). This might well occur if, for example, Cyanobacteria were becoming more numerous during the earlier Mesoproterozoic (Calymmian) -- perhaps due to the advantages of some association with stem eukaryotes -- followed by a period in which they began to be put to work as chloroplasts. During this phase, the carbon-fixing capacities of the former bacteria would increasingly serve to construct the structural elements of the larger, eukaryotic cells. Coupling photosynthesis with the construction of eukaryotic structural proteins would not necessarily affect oxygen production, but it ought to result in the sea-bottom burial of more organic carbon.